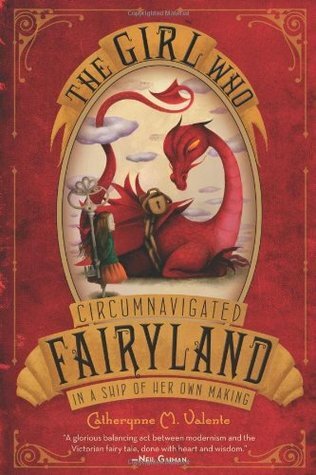 The Girl Who Circumnavigated Fairyland in a Ship of Her Own Making was a fun yet meaningful read. It taught great lessons, but in a way that felt light and entertaining. Catherynne M. Valente's vibrant descriptions and witty wordplay would make this book enjoyable for adults and children and anyone in between. Her use of symbolism in the names of Fairyland creatures and the different destinations and even September's favorite color make the story connect and flow. On almost every page there was personification which breathed life into Fairyland. September's knowledge of magical creatures based on stories she admired back home benefited her greatly. Despite this, she was always surprised when she came across something new. September’s relationships are incredibly realistic, despite the fantasy theme of this book. Valente hits the nail on the head with her descriptions of human behavior and a hunger for control, even in children—especially in children. This story is told by a narrator which gives the readers the gift of knowledge beyond that of the heroine, September. We got to follow the progress of a stray Key who happened to get separated from its owner. We also got explanations for things that September herself did not yet understand. The end of the book was not a cliffhanger, but near the end we found out some news that implied the story was not ready to be done. This news was about our main character, September, and Saturday, a potential love interest for her. Although there wasn’t much (if any) romance in this tale, there was absolutely love. September shows her love for her mother in her regret and she shows her friends caring love. I suspect the next book will have September in a romantic “relationship,” if only a crush. Overall, The Girl Who Circumnavigated Fairyland in a Ship of Her Own Making was beautifully constructed. It reminded me of a cross between The Phantom Tollbooth, Alice in Wonderland, and Peter Pan. There was adventure, curiosity, friendship, and creativity through the roof. I give this book five stars out of five and I can’t wait to read the next one.